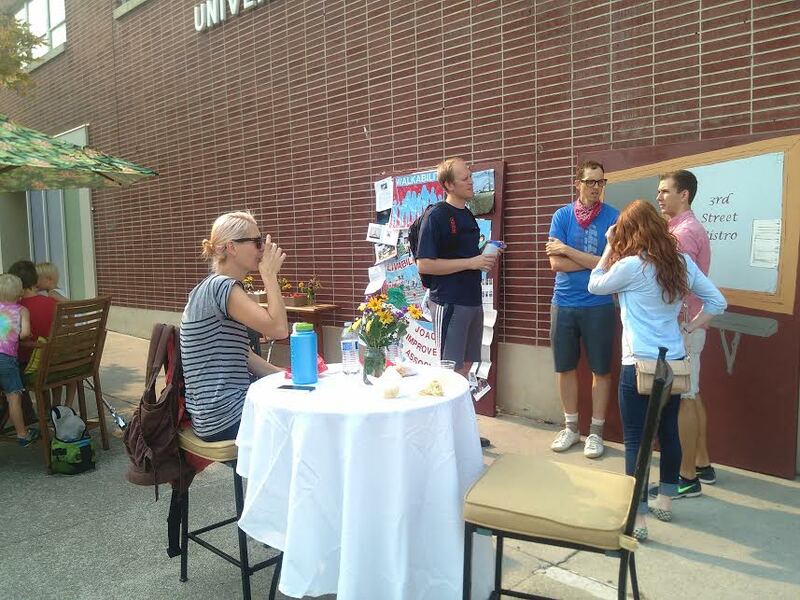 Early this morning, Provo guerrilla urbanists descended on University Ave. to temporarily transform a block and help BRT decision-makers imagine what-could-be. 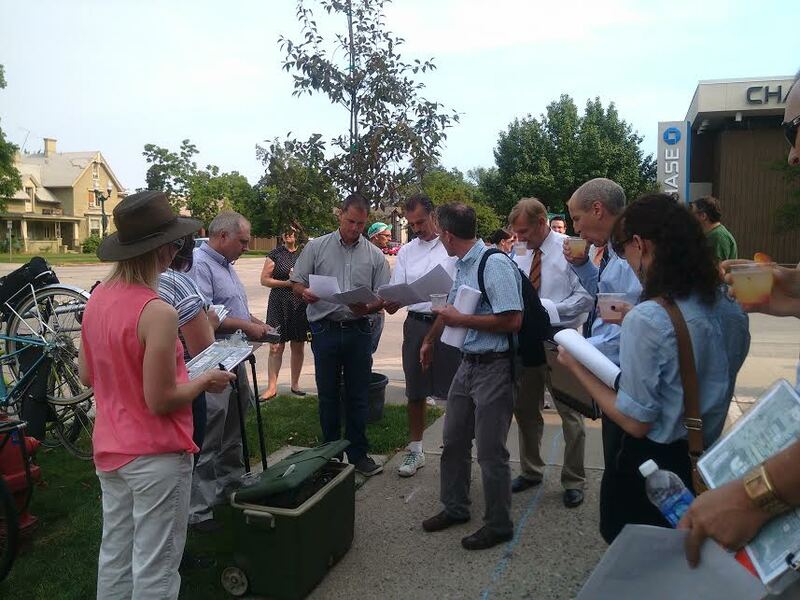 The group measured out the currently proposed BRT street plan, and placed flags where the new sidewalk will end. Flags were also used to demonstrate how bulb outs could potentially improve visibility and create safer intersections. 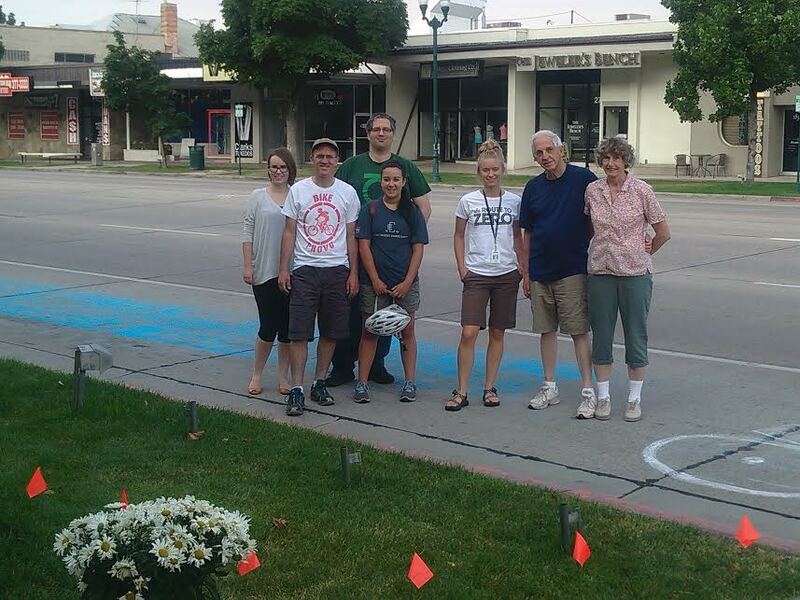 A colored shared-use lane was created with chalk near the side of the road. Currently, the large shoulder allows bicyclists and motorists to easily share the available space. However, the new plan will eliminate the large shoulder and push bicyclists into the lane. 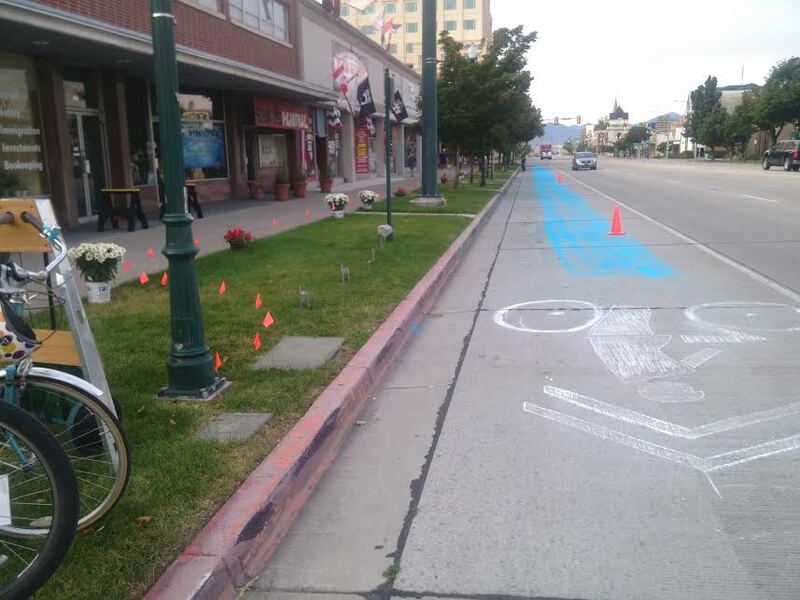 Bicycle lanes are not considered politically feasible for the entirety of University Ave. since they would eliminate parking – however, a colored shared-use lane (such as those used in Salt Lake) would be an effective way of promoting safety for those in cars and on bikes. Potted flowers and trees were brought in to encourage the preservation of as many mature trees as possible and the use of green space throughout University Ave. 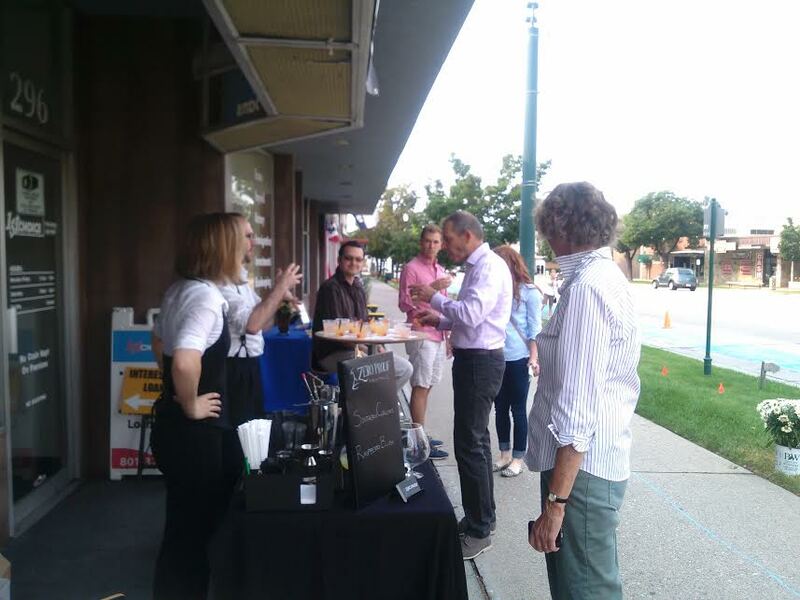 Businesses along the block participated by coming outside and having a more prominent on-street presence, creating a visual incentive for pedestrians to interact and enter storefronts. Signs, flags, and free samples enticed passerbys. Zero Proof Mocktails set up an on-street gathering place with free (and delicious) drinks while conversations took place. 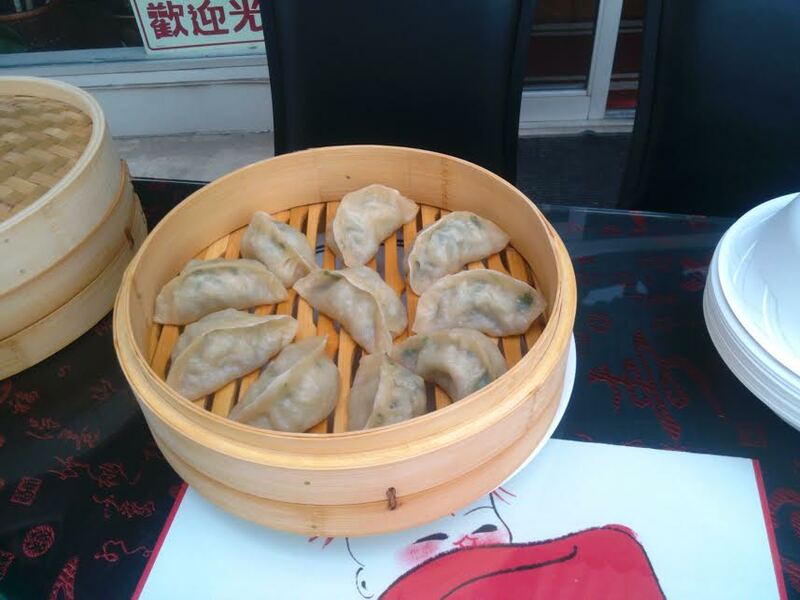 Meanwhile, around the corner, the use of inviting tables, umbrellas, and a mock bistro was so welcoming that people passing through the neighborhood naturally starting congregating and asking questions about the project. In the end, the project hopefully gave decision-makers and Provo residents the chance to re-imagine what University Ave. might become. The truth is that the BRT road construction process (like all major construction) is not going to be pleasant. People are going to get annoyed with the noise, the roadwork, and concerns about any potential changes. However, now is the time to make a thoroughfare that Provo can be proud of – a street that is bustling with business and inviting to all road users. Rarely does a city have the opportunity (and the funding) to re-design a major street into a national example and a go-to destination. Provo has that opportunity right now…let’s encourage decision-makers to step outside of the status quo and take the lead on transforming University Ave.
A huge thanks to Bill Graff, Susan Krueger-Barber, and Aaron Skabelund – the dedicated urbanists that led out on this project. Come See a Piece of Guerrilla Urbanism That Re-Imagines University Ave. Bus Rapid Transit is coming to University Avenue soon. The change represents what may be a once-in-a-lifetime opportunity to re-imagine University Ave. as a street. What could it look like? 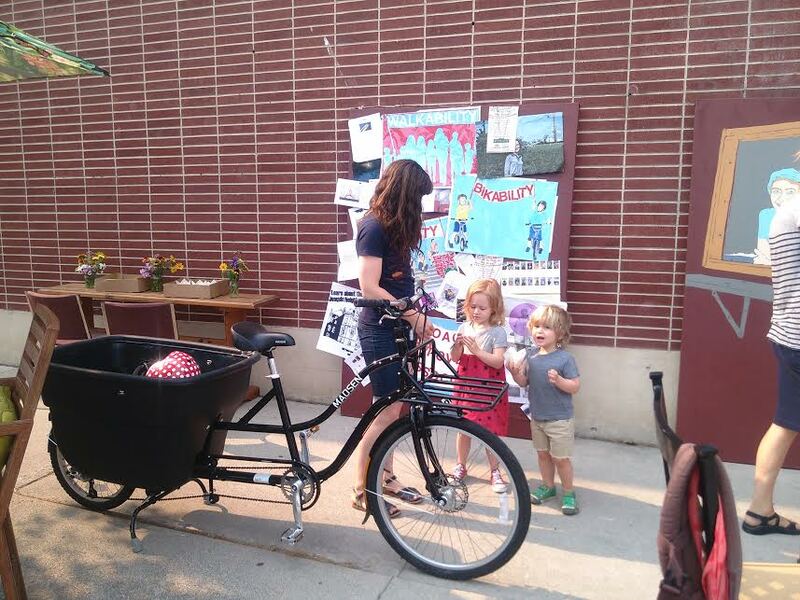 Rather than a speedy route for cars to get through the city could it become a Complete Street that encourages pedestrians and bicyclists while promoting local businesses? Come see what could be possible in a guerrilla urbanism display tomorrow, July 16th from 9-10 a.m. on University Ave between 200 N. and 300 N.
The construction of the Bus Rapid Transit (BRT) on University Avenue with its dedicated lanes running down the middle of the street represents a HUGE once-in-a-lifetime opportunity to transform the downtown blocks into a more livable, pedestrian- and bicycle-friendly, AND business-friendly streetscape from the current unappealing loud automobile thoroughfare. Who wants to spend time in the downtown University area when cars–and oftentimes semis–are noisily hurtling by much faster than the posted 35 mph speed limit? 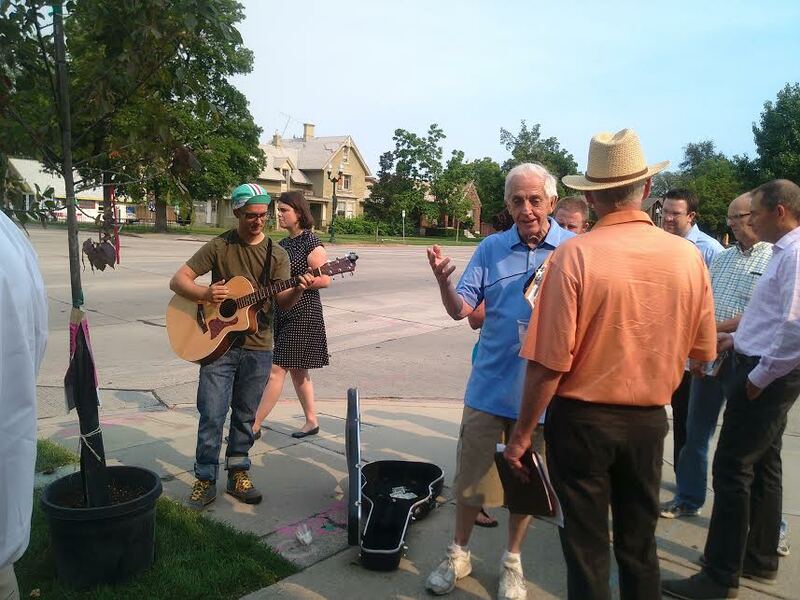 To witness–and participate in–a vision of the downtown University core as a street that is complete and better for everyone–business owners, customers, pedestrians, bicyclists, the increasing number of downtown residents–please drop by University Avenue between 300 N and 200 N this Wednesday between 9 and 10 am. You will see an act of guerrilla urbanism performed by a broad cross-section of concerned citizens of local business owners, property owners, local residents, pedestrians, and bicyclists that (re)imagines the University downtown area as a destination that is inviting, interesting, and people want to be rather than the noisy, fast traffic automobile corridor it is now. To persuade UDOT to slow down vehicular traffic to at the most 25 mph in the core of the downtown from at least 300 South to 500 North. 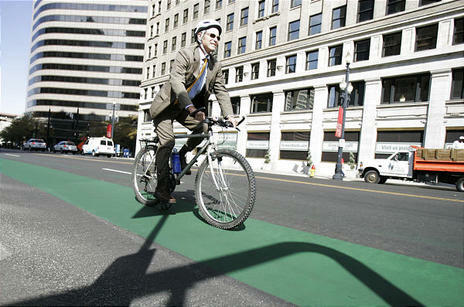 Picture from the Deseret News…if Salt Lake can have green shared lanes, why can’t Provo? 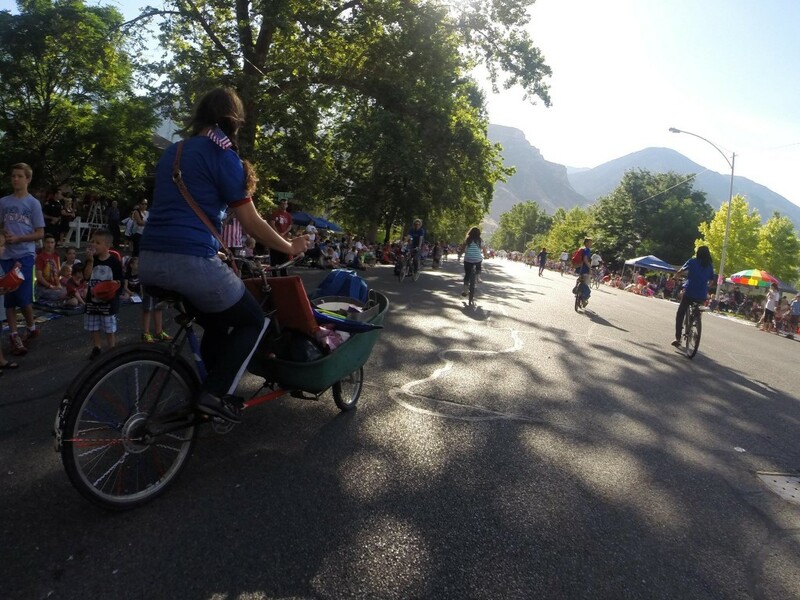 Did You See the Provo Bike Committee at the Parade? 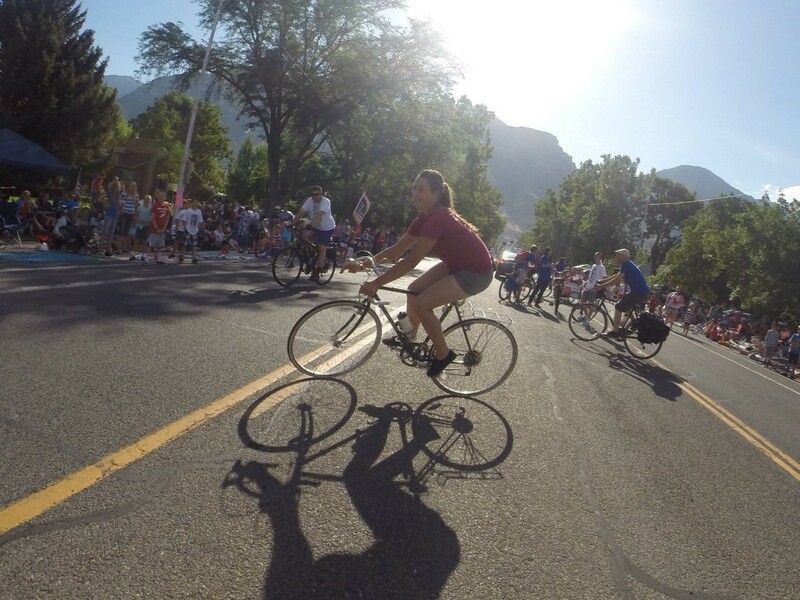 Thanks to everyone that waved hello or took one of the Bike Provo Ride Guides during the Provo 4th of July pre-parade. The Bike Committee riders looked great out there in their custom Leuven t-shirts. If you’re new to the site, please take a look around – in particular, spend a few minutes exploring the links on the top menu bar. Also, thanks to Dixon Holmes for snapping these photos! 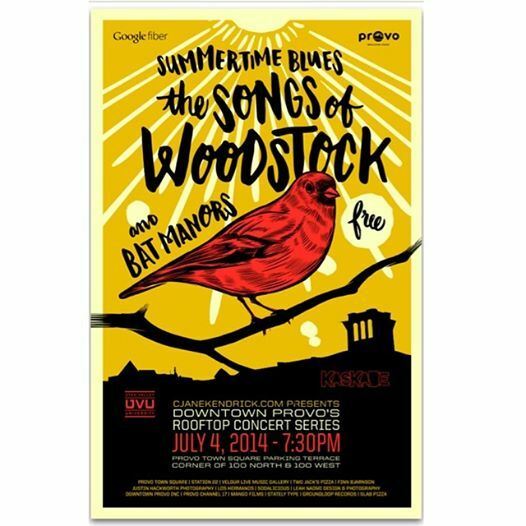 The best way to spend your 4th of July is listening to Provo bands on a downtown rooftop, while your friends sway under the lanterns and watch the fireworks. The best way to get there is to ride your bike. Come to the Rooftop Concert this weekend on two wheels. 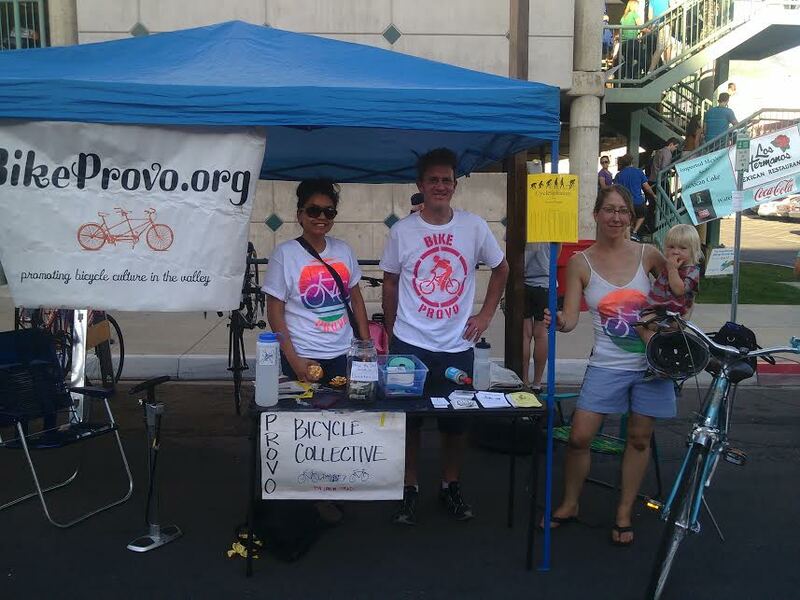 The Provo Bicycle Collective and Provo Bicycle Committee will watch over your ride with tender loving care. And you’ll skip out on 4th of July traffic and parking woes. 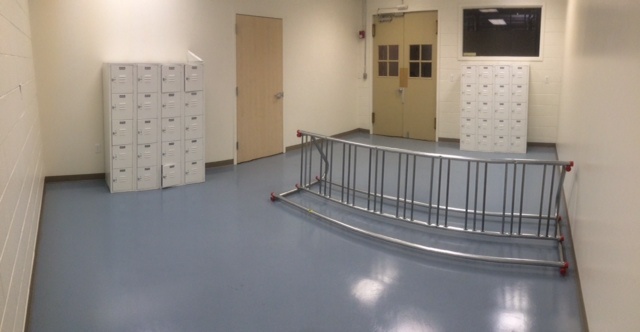 Find the valet bike parking on the West side of the rooftop concert garage.